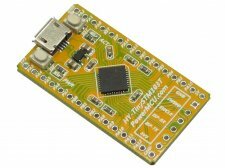 Although very simple this board will allow you to easily build USB application like PC mouse, USB mass storage device, USB Audio class device, USB to Virtual RS232 port. There are plenty of GPIOs on extension headers where you can connect your additional circuits. Important, SWD interface subject to schematic, not PCB screen printing. ISP PIN order is GND, SWCLK, SWDIO, UART1-RX, UART1-TX, 3.3V.